Testing Incentives for Smart Cookies! 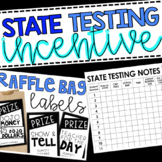 SBAC/Standardized Testing Incentives for students! This product includes fun tags with candy incentives for testing week. It includes a different tag for 10 days total. These fun tags will make your kids smile and be thankful that they have you as a teacher! Reward students with a Special Priviledge Award which allows them to take one problem off any test or quiz. Students LOVE these! Perfect for all ages! - 2 per page. Print as many you would like! - Saved as a doc. for easy name editing. These are tags that I am using for my students during OAA Testing Week. Attach a Smarties candy roll to the bottom of the tag and leave on each student's desk in the morning! These turned out very cute copied in black and white onto colored paper, if you do not have the option of colored ink. 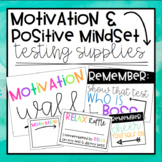 Help the kids relax this testing season by providing a note of encouragement and small reward. This item is based off a pin I saw on Pinterest. Remind and encourage your kiddos about upcoming assessments. 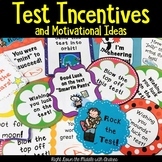 This freebie has a testing reminder bracelet for kids (and parents) along with 3 pages of incentives. Happy testing! These are Pop Rock themed Testing Incentives!! They are colored to go with the flavor of the Pop Rocks!